About 15 minutes from Tomakomai East IC to the ferry terminal! From the direction of Sapporo please use HOKKAIDO EXPRESSWAY. From Sapporo please take JR Muroran Honsen (Muroran Main Line) and get off at Tomakomai Station. Please take a taxi or a bus from the station. * When using a taxi please tell the driver, "Tomakomai Ferry Terminal Nishi-ko (West)." Bus service is available from Sapporo Station directly to Tomakomai Ferry Terminal! * The bus schedule is subject to change. Please contact the bus company for details. 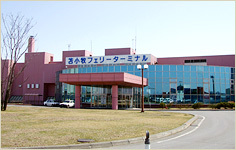 A local city bus service is available from Tomakomai Station to Ferry Terminal.